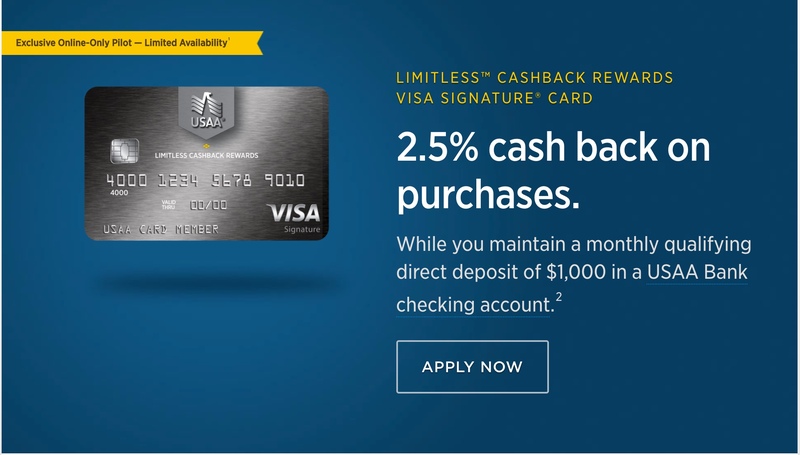 Did We Break USAA on The New 2.5% card? This is a pilot program and only available in select states at the moment, currently it’s available in: LA, NM, KS, ID, PA, SC and WA. Dave’s suggestion of the USAA Limitless 2.5% cashback card has broken the site! Also lots of buzz at Doctor if Credit! Any luck for anyone else on applying? Both Commander in FL and myself in Illinois are unable to apply online right now. I called 1(210)531-8722, turns out it is targeted, and I am not eligible for it because I’m in Illinois, and isn’t part of the roll out. However the states of AK, AZ, CO, GA, ID, IN, KS, LA, MI, NM, PA, SC, TN, and WA are eligible. Not sure when it will expand! Going to have my friends in those states apply, best of luck out there!